Synopsis: A young boy struggling to cope with his mother’s terminal illness finds comfort from an unlikely source. Grief is a complex process which can sometimes begin before a loved one has passed away. When one is ill and all available treatments have failed, and there’s nothing ahead for the sufferer but a slow deterioration, they become like a living ghost – the same, but not the same. The pain and stress and grief of those who love them is intensified by the need to put on a show of normality so as not to add to their loved one’s suffering. It’s difficult enough for someone who has acquired a level of life experience and emotional maturity, so imagine how much harder it must be for a child. 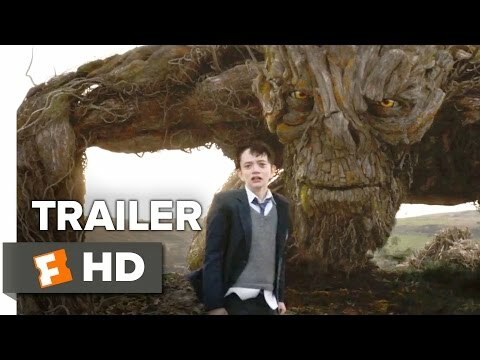 A Monster Calls is J. A. Bayona’s touching study of the unconventional way in which a young boy copes with a heartbreaking situation which one so young should never have to endure. The boy in question is 12-year-old Conor (Lewis MacDougall), a single child whose mum (Felicity Jones – Collide, Rogue One) is approaching, at an obscenely young age, the final stages of terminal cancer. Conor’s father lives in America with his new family, and the boy is resentful of his emotionally rigid Grandmother (Sigourney Weaver – The Cabin in the Woods, Ghostbusters) with whom he has little in common. At school he is bullied by three of his classmates, and his sleep is frequently disrupted by a vivid nightmare in which he struggles to save his mother from plunging into a gaping crevice in the churchyard near their house somewhere in North England. His support network is non-existent, and there’s something increasingly unsettling for Conor in the way that his misdemeanours have begun to go unpunished. Guidance and a sense of stability comes not from the adults in his life, all of whom are caught up in their own emotional maelstroms, but an altogether more fantastic source. Most nights, at 12.07am precisely, Conor is visited by a tree monster (voiced by Liam Neeson- Non-Stop, Run All Night) that is taller than a house, has a low, rumbling voice, and a gruff demeanour. Daunting, implacable, and unmoved by Conor’s outbursts, the monster explains that over time he will tell three tales, and that in return Conor will tell him a fourth. 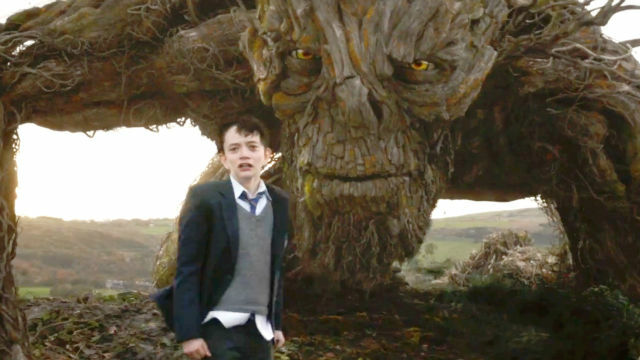 A Monster Calls was always going to be a hard sell, and wasn’t helped by a vague and misleading trailer that only hinted at the film’s true nature. It’s a movie about childhood that is aimed at adults, and explores themes of loss and guilt associated with grief. The subject matter is dark and a little dour, but it is told with a level of imagination and compassion that is genuinely uplifting. The weight of the story falls almost completely on the narrow frame of Lewis MacDougall, and he shoulders the burden with guts and vitality: we sense the spirit in Conor, even when he’s at his lowest and when his anger and frustration bite deep. Jones and Weaver are little more than supporting players, and while Jones is a touchingly frail and almost ethereal presence, Weaver struggles to convince in a role for which she is sorely miscast. She’s there for the American market, of course, so she deserves praise at least for delivering a creditable English accent instead of requiring the screenplay to fabricate a reason for her American one. Spanish director J. A. Bayona adopts a measured approach to the story, and isn’t afraid to take chances – certain sections of the story are animated, for example – and shows admirable restraint when it comes to the sentimental aspects of the tale. It’s a tear-jerker, there’s no doubt about it, but the film never forces emotions upon the viewer, allowing them to develop organically instead. A Monster Calls might not have mass appeal, but it’s a movie for those who – at any stage of their life – have lost someone they love, and for those of us who will lose someone in the future.